Though she now lives in New York City, Fathom editorial assistant Becky Cheang grew up in Singapore and has been pining for the local food ever since she left in 2012. With the greatest of ease, she ticks off a list of her favorite local dishes around the clock. SINGAPORE – Towards strangers, we Singaporeans are a pretty reserved group. But mention food and our eyes light up, the conversation gets going, and you have a new friend. I moved to New York a few years ago, and though I miss my family and friends, I really miss eating and talking about the food. New York City doesn't lack for good food, but I've yet to find satisfying Singapore hawker (street food) fare. Yes, places like Nyonya and the New Malaysian Restaurant in Chinatown do a pretty decent job recreating the dishes of my homeland, but there's a certain something missing. Maybe it's the hot, muggy, crowded hawker centers, with food prepared in massive black woks over hot fires, by hands so calloused and experienced they don't register the scalding heat anymore. Every dish is absolutely personalized to your tastes. Because you speak directly to the cook, you can ask for less oil, more chili (always), and swap out ingredients you don't like for more of the ones you do. 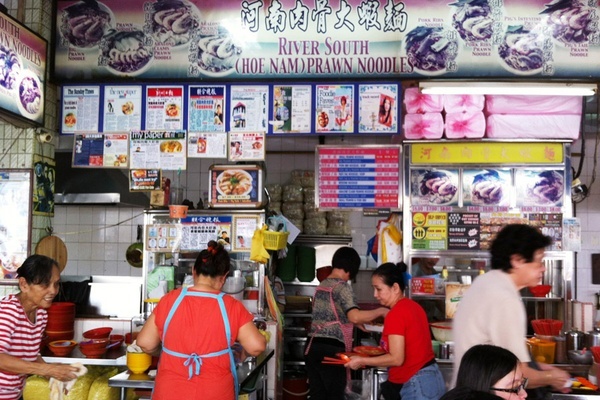 All, I might add, for dirt cheap prices (an average chicken-rice dish costs about S$2.50.) You just can't get this experience in New York. On a recent trip back, I ate my way through all my favorite local places. Here's a smattering of (just about) everything I miss. 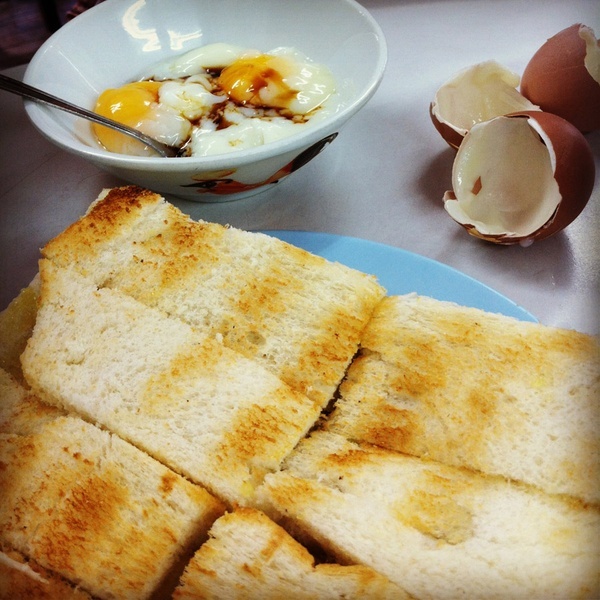 Kaya toast and eggs for breakfast. Where: You can get decent ones at almost any hawker center; Ya Kun Kaya Toast is a franchise found in various locations around the city. What: Steamed rice cake served with a preserved radish relish. A normal single serving is about three or four cakes, and I always order extra chili paste on the side. Where: Stall #01-31 at Ghim Moh Food Centre (20 Ghim Moh Rd.). 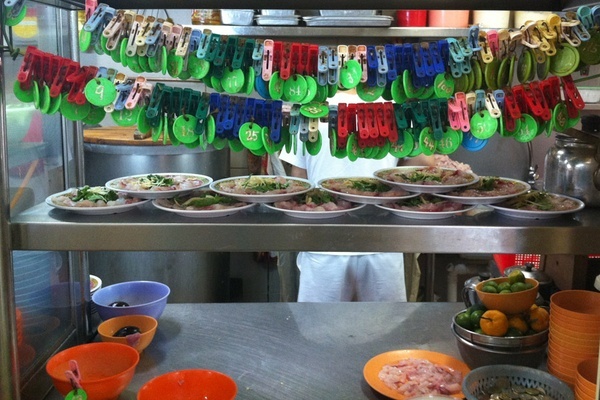 The chefs at Hong Kee Porridge have a very elaborate ordering system. Raw fish porridge (background) and pork porridge from Hong Kee Porridge. 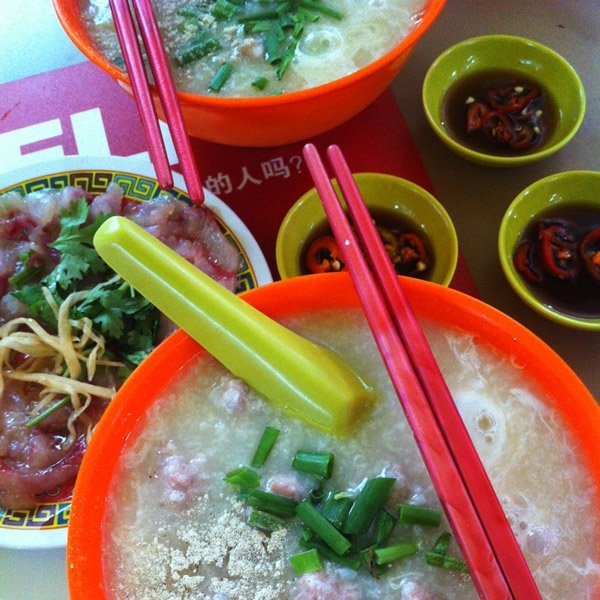 What: Porridge with a handful of minced pork, ginger slices, and chives. I always request an egg on top. A variation on this is raw fish porridge: Sashimi is added and cooked by the heat of the congee. Where: I have two favorites. Hong Kee Porridge in Commonwealth Crescent Market and Food Centre (31 Commonwealth Crescent, Stall #02-89) is the one near home; Tian Tian Pork Porridge at Chinatown Food Centre (336 Smith Street, Stall #02-185) is special for Saturday mornings with mom and grandma. What: Coconut milk-infused rice served with a fried egg, fried fish or chicken wing, cucumber slices, roasted peanuts, fried anchovies, and a spoonful of sambal chili — wrapped up in a huge banana leaf. In case you couldn't already tell, nasi lemak literally means "fatty rice" in Malay. Where: It's another local classic, so you should find it most places, but my favorite is Selera Rasa, Stall 2 in Adam Road Food Centre (2 Adam Rd.). 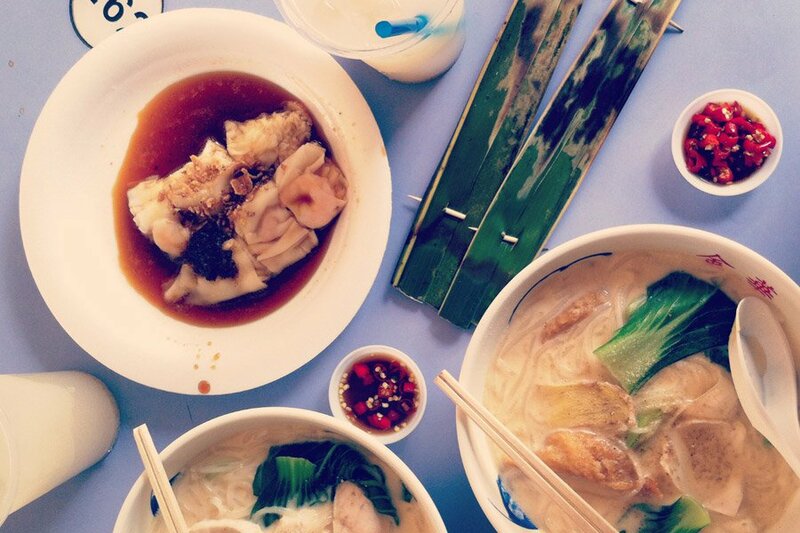 Fish slice bee hoon from Old Airport Road. It's Becky's favorite dish in the world. Most of these dishes work for both lunch and dinner, though I've eaten several for breakfast as well. What: My favorite dish. I think about this every day. No lie, it's always on my mind. The ingredients are simple: thick white noodles, fresh or fried fish slices, ginger for spice, choy sum (a Chinese cabbage), tomato, tofu, and dried seaweed. Evaporated milk and dash of XO Cognac makes the soup so, so good. Where: Stall #01-05 in Holland Village (19A Dover Crescent) serves my late-night cravings. For lunch, I brave the line at Stall #01-121 in Old Airport Road Food Centre (51 Old Airport Rd.). What: It means "smashed chicken" in Malay. The chicken is fried, then smashed with a mallet before it's covered in sinfully delicious deep-fried batter crumbs and generously dolloped with extra spicy sambal chili. It's served with fresh cabbage and rice. Where: Though it's a little pricier (S$6) than the ones you'll find in normal hawker centres, I like Resto Surabaya (#05-26, Far East Plaza, 14 Scotts Rd.) the most. 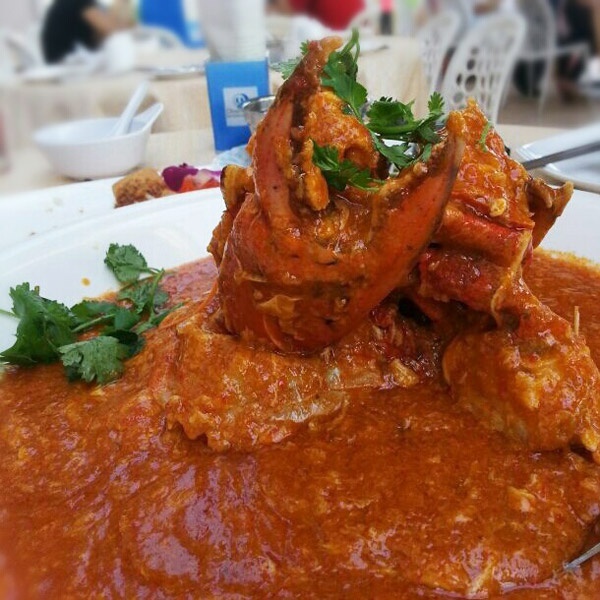 Chili crab is always a messy affair. What: Admittedly, this isn't common hawker fare, but I can't write a Singapore food post and not mention chilli crab. Be sure to order some fried man tou (bread buns) to dip in the thick gravy. Where: My family always goes to a Jumbo restaurant to get it. The one in East Coast Park (Blk 1206 East Coast Pkwy, #01-07/08) is right by the sea and feels extra fresh. What: It tickles me that Gordon Ramsay came to Singapore and was absolutely thrown by the complexity of this Peranakan dish. The fluffy bean curd puffs, bean sprouts, cockles, shrimp, fish sticks, and noodles are served in a coconut curry soup with a spoonful of crushed coriander. Note the copious amounts of sliced chili padi on my noodles. What: You can choose which type of noodle you want and whether you want it in a rich stock soup or dry with the soup on the side. You even have a choice of prawns and whether you want to add extra meat (pork ribs!). I always get thin white noodles in the soup with large prawns. 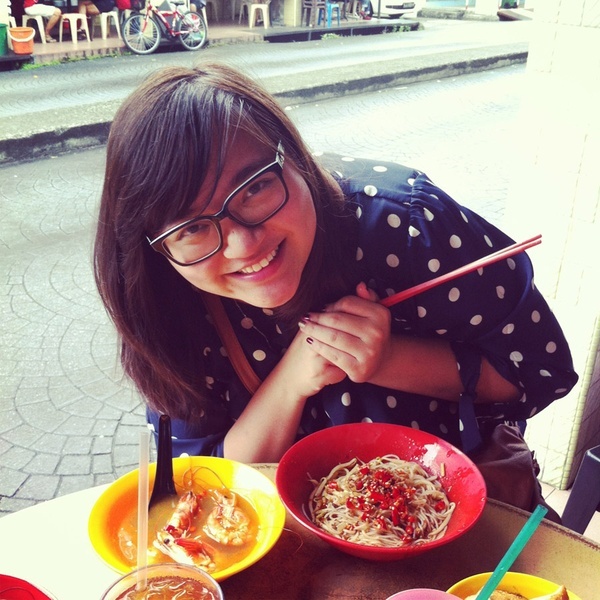 Where: My favorite is River South (Hoe Nam) Noodles House (31 Tai Thong Crescent). What: The chicken is steeped in a master stock, usually a chicken or pork stock that has been reused over and over again, with the addition of more water for a stronger flavor over time. The rice is cooked in a seperate batch of chicken stock, sometimes with pandan leaves. 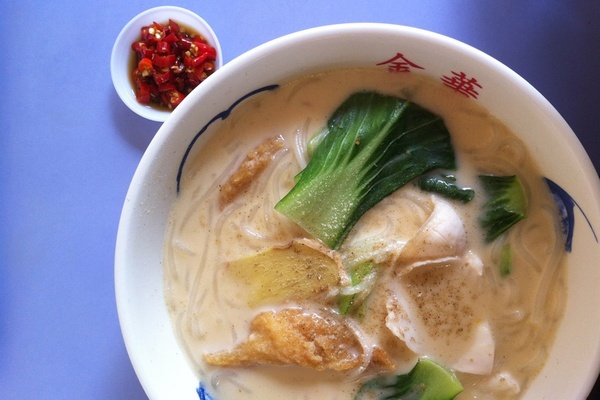 You choose between liu ji (traditional stock chicken), shao ji (roasted chicken), or bai ji (the chicken is submerged in ice immediately after cooking to give the skin a white jelly-like texture). Where: Boon Tong Kee and Tian Tian Hainanese Chicken Rice in Maxwell Centre (1 Kadayanallur St., Stall 10) are the two big names. But since this is a classic Singaporean dish, you can get decent ones at almost any hawker center. 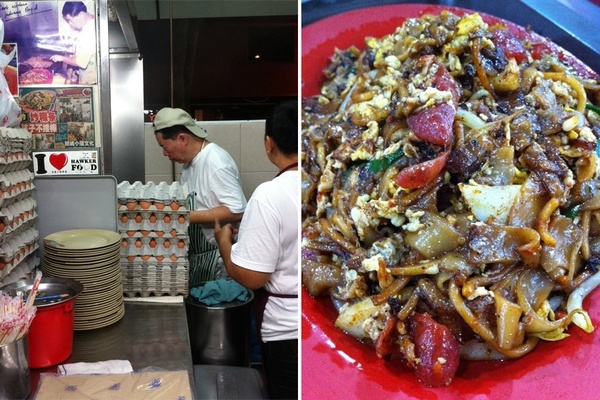 Mr. Ho Kian Tat serves up the best char kway teow in town. What: Flat rice noodles stir-fried in a dark soy sauce with bean sprouts, chives, cockles, prawns, and Chinese sausages. Fried pork lard probably makes char kway teow the least healthy dish on this list. Where: I grew up on, and will always love, Stall 18 at Zion Riverside Food Centre (70 Zion Rd.) The queue is always insane, but that's how you know it's the best. What: Yes, stingray. It's barbequed and topped with sambal chili and served on a banana leaf. The sambal is a mix of shrimp paste, shallots, sugar (occasionally), and walnuts. Always pair this with sugarcane juice; it helps with the spice. Where: My first time was at Chomp Chomp Food Centre (20 Kensington Park Rd.). There are probably better ones around town now, but you never forget your first. 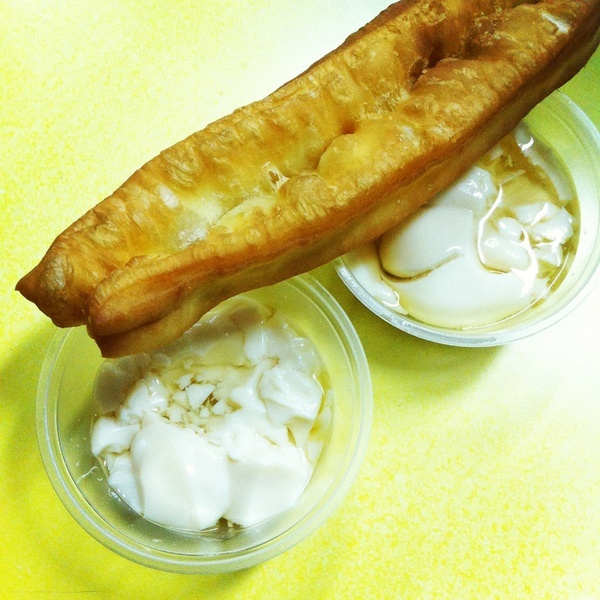 You tiao with tau huey at Rochor Original Beancurd. What: Tofu pudding served with sweet syrup. Get you tiao (fried flour stick) to dip into tau huey. Where: My favorite is Rochor Original Beancurd (2 Short St.). There is a modern variation with a milkier texture made popular by Lao Ban (Stall #01-127) and 51 Soy Bean (Stall #01-72). Both can be found at Old Airport Road Food Centre (51 Old Airport Rd.). What: My favorite dessert, also know as ah balling. Glutinous rice balls filled with peanut, black sesame, or red bean, served in a sweet peanut or red bean soup. Where: Stall 75 in Maxwell Center (1 Kadayanallur St.). 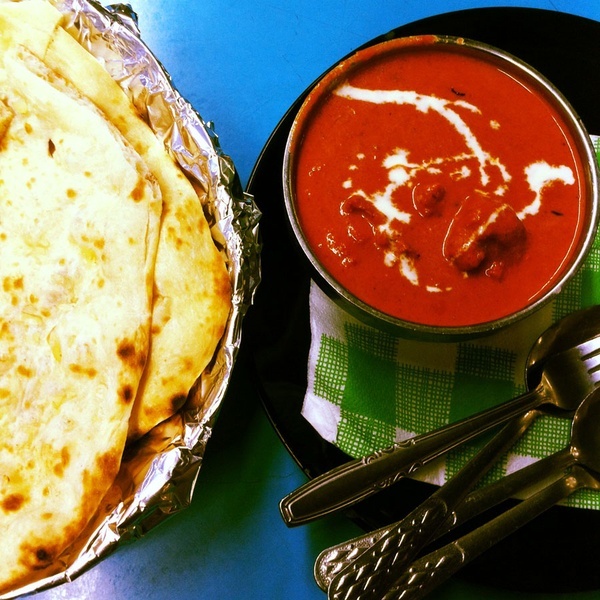 Garlic naan and butter chicken masala from Al-Azhar Restaurant. Say what you will about New York never sleeping; The supper culture in Singapore is really alive and well. The streets are incredibly safe, and that makes for easy nights out. My fourth meal of the day starts anytime between 10 p.m. and 2 a.m.
What: A creamy Indian dish that has to be eaten with garlic naan. It's always a game of rationing, but I think two pieces of naan is enough for your masala. If you're still hungry, tissue prata is delicious. It's a paper-thin crepe wrapped in a cone and sprinkled with sugar. Where: Al-Azhar Eating Restaurant (11 Cheong Chin Nam Rd.) is open 24 hours. What: This version of prata is made by flipping flour dough multiple times until it's very thin, like a pancake. It's fried plain or with savory ingredients like egg, mushroom, or onion. It's served with chicken or fish curry to dip. I always get one with egg and one kosong (empty or plain) that I sprinkle with sugar. Where: The Roti Prata House (246M Upper Thomson Rd.) is open until 2 a.m.
What: Yes, it does taste like chicken, albeit gamier, as it is all muscle. Normally stir-fried with ginger and scallions or dried chili, the Cantonese dish is served family-style in a clay pot with plain congee or white rice on the side. 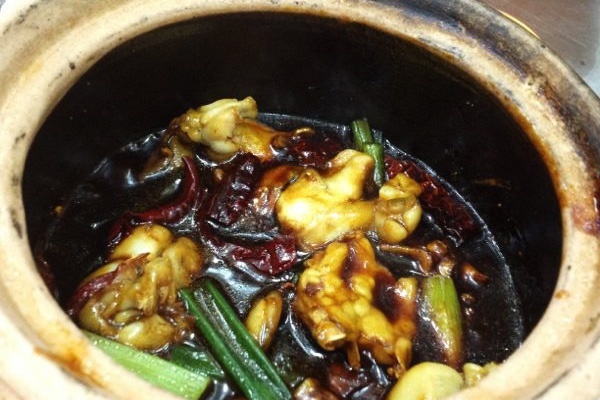 Where: Lion City Frog Porridge (235 Geylang Rd., Lorong 9) is open until 3:30 a.m.
Frog leg with dried chili. Left: A considerately modest spread for the night; Right: Yolk custard in the liu sha bao. 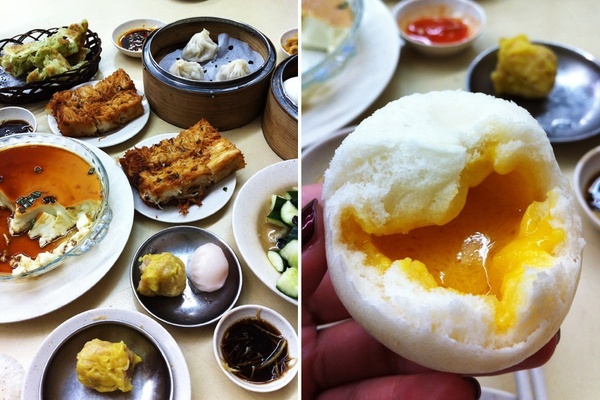 What: Dim sum for late-night dinner? Blasphemy! But not in Singapore. I'll drag my friends to this block-long spot at 3 in the morning. It's always crowded and holds a special place in my heart because this was where I discovered liu sha bao, a creamy egg custard bun. When you bite into it, yolky goodness flows out. 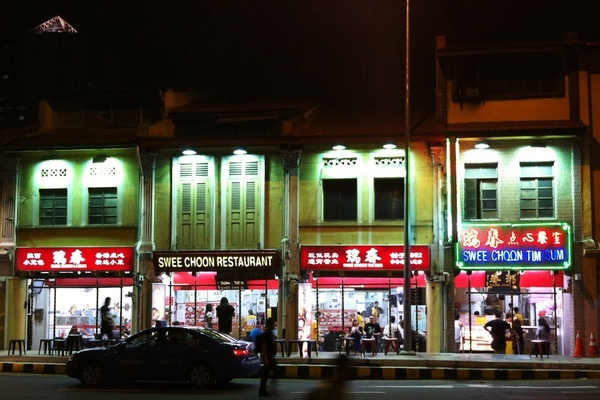 Where: Swee Choon Tim Sum (183-191 Jalan Besar) is open from 6 p.m. - 6 a.m. Feeling overwhelmed? When in doubt, find the longest line and join it. Say "what he's having" when you step up to place your order. You won't be disappointed.